After Louisville’s 17-point victory over Syracuse in the Big East tournament, it’s hard to see them not reaching the Final Four. Of course, you should never underestimate Coach K.’s Duke squad. If they’re hitting 3’s, they’re good enough to beat any team in the country. Michigan State might also be competitive, but don’t expect too many bracket busters to come from the Midwest. This division is full of wild cards. Kansas is obviously top dog, but don’t tell that to the Bulldogs of Georgetown. They’re frothing at the mouth to earn some tournament glory after getting bounced from the Big East tournament. This division is actually stacked. Hell, even 11-seeded Minnesota beat Indiana earlier this season. Any grouping that has bracket-buster extraordinaire VCU in it is destined for some classic NCAA tournament wackiness. Gonzaga is a weak #1 seed. 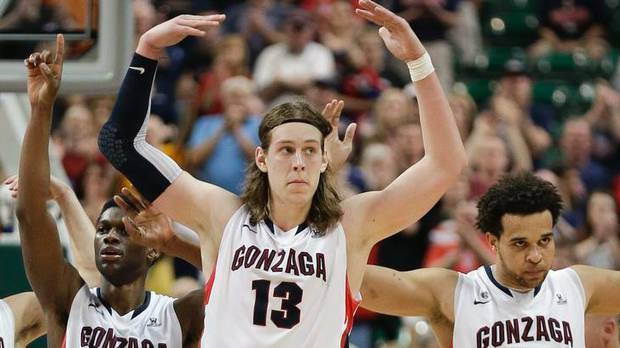 They have very few quality wins and their star, Kelly Olynyk, has a mullet. That’s not a recipe for success. Look for Ohio State, Kansas State, Wisconsin and even Pitt to challenge Gonzaga for a spot in the Final Four. Because this is the weakest division by far, anything is possible in the West. Who knows, maybe Harvard will go Linsane on the competition. Seriously, who knows? Forget about the top seeds in this division for a second. Butler is here, which means there’s no point in making predictions in the East. Butler is capable of complete bracket annihilation. Back to reality: the Bulldogs will have to take down the likes of Indiana, Miami and Syracuse if they want to go on another miracle championship run. Of course, if there’s one thing we’ve learned over the last few years, it’s to never bet against Butler come tournament time. · Oregon: The Ducks have a few quality wins under their beaks. · Pitt: They survived the Big East with the fourth best conference record and beat both Georgetown and Syracuse already. · Minnesota: The Golden Gophers could do anything from making the Final Four to getting knocked out in the first round. · Every Atlantic 10 team: It may not be a glamour conference, but the A10 has more teams in the tournament than the ACC. True story. The first two are easy choices. Wisconsin beat Indiana twice, which means they have the potential to beat anyone. Miami has possibly the best backcourt in the country in Shane Larkin and Durand Scott. Plus, they just won the ACC outright and the conference tournament. In the end, we’re looking at a Louisville/Miami final game that could be pretty epic. I’m picking Miami to blow away the competition (Get it? Because they’re hurricanes?) with a 61-54 victory over the Cardinals.